It’s her last night of carefree singlehood before she finally walks the aisle. You want to give her the best gift you can find, not just to celebrate your friendship but also the fabulous journey she’s about to take. Whether you want to impress your girlfriend on her bridal shower or simply entertain her and her guests when she opens your present, you’d go the extra mile to hunt for the perfect gift. But where do you start? There are hundreds of options seemingly bearing the gift you wish to find and you don’t have the luxury of time nor the energy to explore every one of them. There’s a solution to that. To narrow down your choices, streamline your ideas and focus on two important things: your budget and what you feel would make the would-be-bride cry her heart out or smile from ear to ear. Once you’ve made up your mind, the next big step is to go to the best places where you can find the item of your desire. You can think out of the box and not just gift her with conventional items, but rather go for the extraordinary, like a sonic image of your voice greeting her framed in a canvas, and then soften it up by pairing it with her favorite perfume or a designer scarf in her preferred hues. When it comes to giving her the best gifts, the choices are out there for the picking. You just have to know what she’s passionate about. Does she like jewelry? Is she into the latest fashion? Is she a trendsetter or a classic dresser? Or maybe she is into sports or loves flower prints. Is she a reader or a writer? Does she appreciate a splash of colors, or does she love being a minimalist, opting for the cleaner shades of gray, black or white? Does she appreciate fresh citrusy scents, or is she on the wilder side? Does she own a closet full of shoes, or does she love to travel and eat out more than she loves shopping? Does she have kids, or does she fancy having one? You have to know what the bride is about, her joys and her wants, before you can pick the best item to put in your gift bag. Gift Idea: Make the would-be-bride feel absolutely beautiful and pampered on her bridal shower and wedding day. You could indulge her with the Lancôme line of beauty essentials that usually come with a bonus gift of skin solutions and lip colors. Pair them with sweet floral scents from popular perfume brands such as Chloe, Kenzo and Gucci. And you may also throw in a lovely makeup bag so she has something to put her beauty kit in. The coolest thing about shopping for gifts these days is the convenience of having stores that have most of the merchandise that you could ever think of finding all in one place. And you can shop by going online or simply stepping inside a brick-and-mortar store. 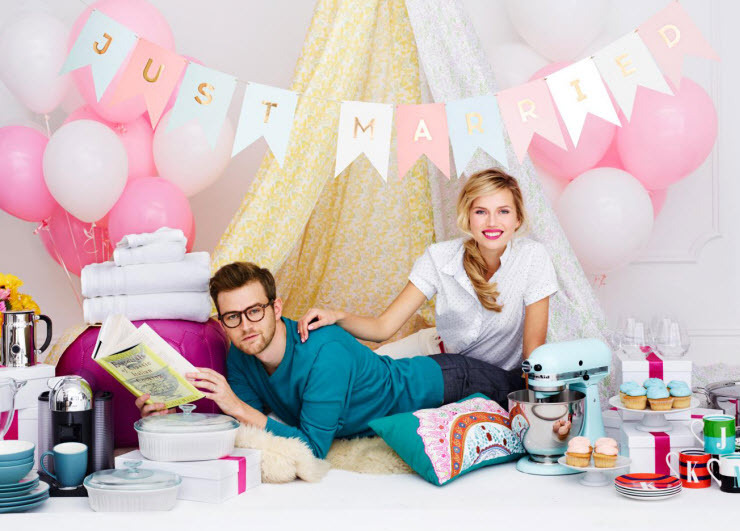 Macy’s, one of the largest retail stores of products and brands for women, for example, has all the bridal shower gifts that a bride-to-be would love to receive. You can choose from the widest variety of scents, jewelry, shoes, beauty products, fashion items including clothing and accessories, and a whole lot more that your precious bride-to-be would definitely enjoy.The store offers not just the best bridal shower gifts in the industry, but with huge savings to boot — and you’ll even be able to treat yourself for a job well done with Macy’s Give a Gift, Get a Gift offer. Now through June 30, when you get a gift off a registry, you’ll get $20 off your next purchase of $50 or more! Make her bridal shower something to remember your friendship and your good times together. Happy gift hunting!